Be the first to share your favorite memory, photo or story of Naomi. This memorial page is dedicated for family, friends and future generations to celebrate the life of their loved one. 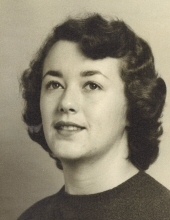 Naomi May (Gregson) Ramsey, 86, wife of Thomas Odell “T.O.” Ramsey, Jr. of 44 Lea Drive passed away Monday, January 28, 2019 at Birch Gardens in Fishersville. Mrs. Ramsey was born on October 31, 1932 in Philadelphia, Pennsylvania. She was a daughter of the late Carl Louis, Sr. and Mary (Poage) Gregson. In addition to her parents, Mrs. Ramsey was preceded in death by a brother, Carl Louis Gregson, Jr. Surviving in addition to her husband of 62 years are two sons, Robert Stuart Ramsey and his wife Robin of Chester and William O. “Bill” Ramsey and his wife Kym of Fishersville; a daughter, Lucy Ramsey Marion and her husband Chris of Fishersville; a brother, Jeff Gregson and his wife Teresa of Elkwood; two sisters, Carol Mills of Roanoke and Molly Koon and her husband Larry of Floyd County; seven grandchildren, Summer Ramsey Powers and husband Jacob, Paige O’Dell Ramsey, Thomas Odell Ramsey, III, Robert Doran Ramsey, Abigail Gregson Holland, Anna Grace Ramsey and Emma Ramsey Holland; two step-grandchildren, Cooper Thomas Marion and Simone Arden Marion and a number of nieces and nephews. The family will receive friends from 5:00 to 7:00 p.m., Friday, February 1, 2019 in Coffman Funeral Home and Crematory. A Memorial service will be conducted at 11:00 a.m., Saturday, February 2, 2019 in Tinkling Spring Presbyterian Church by Rev. Rosalind Banbury and Rev. Merle Fisher. It is suggested those desiring make memorial contributions to Tinkling Spring Presbyterian Church, C/O the Student College Fund, 30 Tinkling Spring Drive, Fishersville, VA 22939 or the Alzheimer Association, 1160 Pepsi Place Suite 306, Charlottesville, VA 22901. The family would like to offer a sincere “Thank You” to the wonderful staff at Birch Gardens for the care given to Mrs. Ramsey. Coffman Funeral Home and Crematory, 230 Frontier Drive in Staunton is in charge of her arrangements. To send flowers or a remembrance gift to the family of Naomi May (Gregson) Ramsey, please visit our Tribute Store. Alzheimer Association, 1160 Pepsi Place Suite 306, Charlottesville, VA 22901. "Email Address" would like to share the life celebration of Naomi May (Gregson) Ramsey. Click on the "link" to go to share a favorite memory or leave a condolence message for the family.